At Central Vermont Medical Center there are over 30 distinctive departments employing over 1,000 people who are all unified in carrying out the mission of our medical center. 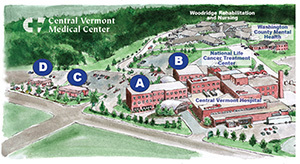 At Central Vermont Medical Center, there are over 30 distinctive departments employing over 1,000 people. These departments vary in their hours of operation, staffing, and areas of responsibility. If you are a patient of CVMC, you may never come in contact with most of the people who work behind the scenes to make your hospital experience a positive one—but all are unified in carrying out the mission of Central Vermont Medical Center. Pregnancy and Childbirth: Nothing is more important to us than the health of you and your baby. Primary Care: Find a primary care provider for yourself and your whole family. Cancer Care: Learn about our collaborative and comprehensive approach to cancer care close to home. Emergency & Express Care: We are here when you need us, 7 days a week. Imaging & Radiology: Our board-certified radiologists and technologists perform a variety of tests. Orthopedics: Our board-certified orthopedic surgeons get you back to work or play. Rehabilitation Therapy: Offering physical, occupational and speech language therapy. Women's Health: From the birth of your child, to health screenings, nutritional counseling and more.